The following diagram shows the medians of a triangle. Scroll down the page for more examples and solutions of how to construct the median of a triangle. The median is a line segment that joins a vertex and the midpoint of the opposite side of a triangle. A triangle has three medians. The point of concurrency of the medians is called the centroid. The centroid is the center of mass of an object of uniform density in the shape of a triangle. The object will balance on any line through the centroid. The centroid is two-thirds the distance from the vertices to the midpoint on the opposite side. 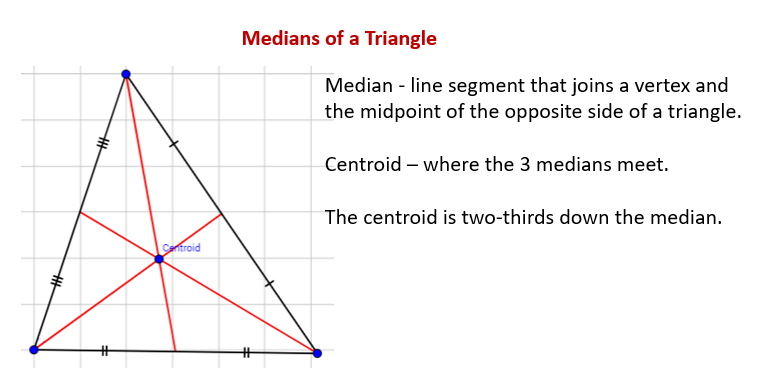 A median is a line segment from the vertex to the midpoint of the opposite side in a triangle. In every type of triangle, the median will be contained within the polygon, unlike altitudes which can lie outside the triangle. When constructing a median, we first find the midpoint of the side opposite the desired vertex, then use a straightedge to connect the midpoint and the vertex. How to construct the three medians of an acute triangle? How to construct a midpoint using a compass? The meeting point of the three medians will form the centroid of the triangle. 1. Open the compass past the estimated midpoint of the side. Strike an arc. 2. Keeping the same setting, move to the vertex on the opposite side of the side you are working with. 3. Strike an arc such that it intersects the first arc twice. 4. Use a straightedge to find the midpoint of the side. 5. Draw a segment from that midpoint to the opposite vertex. Do this for all three sides and you'll find the centroid of the triangle.